Only Lee Breuer’s fantastical imagination, wit, and encyclopedic knowledge of theater, in association with his longtime collaborator Maude Mitchell, could fashion a play that applies the strategies of Marcel DuChamp’s “readymades” to Tennessee Williams’ classic and lesser known works. Add to that a dose of inspiration from Mary Shelley and Lord Byron, and voila! the world premiere of “Glass Guignol: The Brother and Sister Play,” November 28-December 23. Coinciding with Breuer’s 80th birthday and the grand opening of Mabou Mines Theater, the company’s first permanent venue, a 99-seat black box located in the newly renovated 122 Community Center (122CC), formerly Public School 122 on 9th Street and 1st Avenue, the opening of Glass Guignol celebrates an end to almost 50 years of nomadic life for this trailblazing theatrical tribe. PREVIEWS: Tuesday, November 28-Tuesday, December 5. All curtains are at 7:30pm, except Sunday, December 3, which is at 3pm. There is no performance on December 4. PRESS PREVIEWS are December 2 at 7:30pm, December 3 at 3pm and December 5 at 7:30pm. OPENING NIGHT: Wednesday, December 6 at 7:30pm is a benefit performance for Mabou Mines. PERFORMANCES, December 7- December 23, Tuesday through Saturday at 7:30pm; Sunday matinees are at 3pm. MABOU MINES is an artist-driven experimental collective, generating original works and re-imagined adaptations of classics through multi-disciplinary, technologically inventive collaborations among its members and a wide world of contemporary composers, writers, musicians, choreographers, puppeteers, visual artists and filmmakers. For more than forty years, the company’s one hundred productions have toured to more than thousand venues worldwide. The company’s work has been shown annually at NYC venues including La Mama E.T.C., St. Ann’s Warehouse, The New Victory Theater, and NYU Skirball Center. The company continues to tour nationally and internationally, most recently to The Brighton Festival, The National Theater of Norway, The Kennedy Center, Arts Emerson. Among its many achievements, the company has won close to a hundred major awards, among them twenty OBIEs (including General Excellence & Sustained Achievement) as well as the Zeisler Award (TCG), The Edwin Booth Award, Edinburgh Festival Golden Herald Angel Awards, Foundation for Contemporary Arts Fellowship, Elliot Norton Awards, and three USA Fellowships. Mabou Mines archives, 1970-1995, “The First 25 Years,” are housed at the NYU’s Fales Collection of Bobst Library. Mabou Mines current members include Co-Artistic Directors Lee Breuer (co-founder), Sharon Fogarty, Karen Kandel, and Terry O’Reilly along with Associate Artists David Neumann, Clove Galilee, and Maude Mitchell. LEE BREUER (Director; Co-Conceiver and Adapter) is a Mabou Mines co-founder, a writer, director, poet, playwright, adapter, lyricist, and filmmaker engaged in a lifelong process of creating incendiary experimental theater projects in Europe, Asia, Africa, North and South America. Breuer has directed thirteen OBIE Award-winning performances, and received numerous awards including: a MacArthur Fellowship, a Chevalier of the Order of Arts and Letters, OBIE Awards for Playwriting, Directing, and Distinguished Achievement; and The Edinburgh Herald Archangel Award for sustained achievement. Getting Off – Lee Breuer on Performance by Stephen Nunns published by TCG; Red Beads – Performance Poem with photography by Beatriz Shiller, published by PAJ 117. His interpretation of Horton Foote’s A Coffin in Egypt premiered at Elka Park, NY in Summer 2017. His new film, The Book of Clarence, premiered at MoMA in Spring 2017. An upcoming workshop of, Medea, adapted by Olga Taxidou, will take place at Mabou Mines’ new theater in spring 2018. His next book: La Divina Caricatura, The Trilogy, will be published by the Seagull Press. MAUDE MITCHELL(Co-Conceiver and Adapter; The Sister), a Mabou Mines Associate Artist, is an actor, dramaturg, adapter, and teacher best known for her performance as Nora (OBIE, Backstage West Garland, Elliot Norton, Drama League) in Mabou Mines Dollhouse (Adaptation Mitchell/Breuer, Dramaturgy/Mitchell, Direction/Breuer), which opened at St Ann’s Warehouse and was toured world-wide 2003-11; film version by ARTE (Premiere, Paris 2008). Mitchell was the dramaturg on Breuer’s production of Tennessee Williams’ Un tramway nommé désir. which premiered at the Comédie Française in Paris in 2011. She was recently featured in Horton Foote’s A Coffin in Egypt directed by Lee Breuer. She will play Medea in the upcoming workshop of Olga Taxidou’s adaptation of Sophocles’ Medea at Mabou Mines. piece by piece productions is a not for profit producing organization that was started in 1999 by Wendy vanden Heuvel. 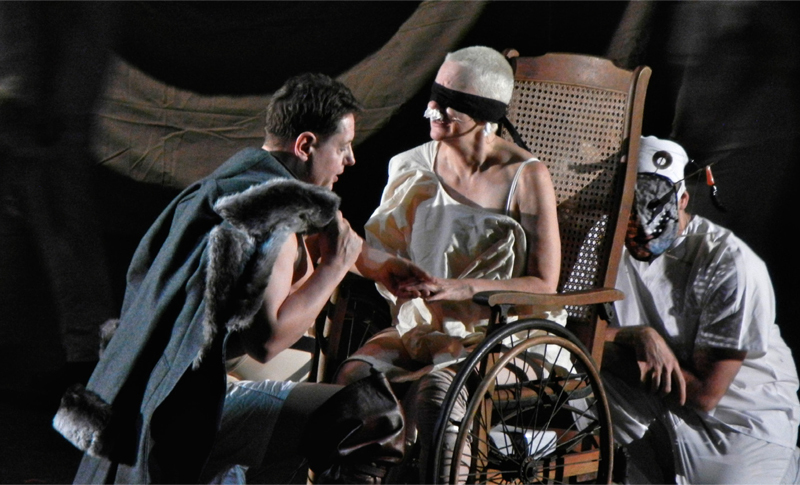 Productions have included: Medea directed by Deborah Warner with Fiona Shaw on Broadway (associate producer), The Tricky Part (2004 Obie award and two Drama Desk nominations including Outstanding Play) by Martin Moran and All The Rage, (Lucille Lortel Award, Outstanding Solo Show 2013) by Martin Moran produced with Rising Phoenix Repertory and The Barrow Group; The Walworth Farce by Enda Walsh; Mabou Mines DollHouse, Emma Rice’s Brief Encounter and Let The Right One In, all in association with St. Ann’s Warehouse; My Name is Rachel Corrie in association with The Royal Court Theatre; Slipping in association with Rising Phoenix Repertory and Rattlestick Playwrights Theater; Elective Affinities with Zoe Caldwell by David Adjmi, co-produced with Rising Phoenix Repertory and Soho Rep; Lee Breuer’s La Divina Caricatura in association with St. Ann’s Warehouse, La Mama ETC, Mabou Mines, and Dovetail Productions; and Hundred Days by The Bengsons and Kate E. Ryan, co produced with Z Space (TBA Outstanding New Musical 2014). piece by piece productions has been a producer with co-creaters Brian Mertes and Melissa Kievman on The Lake Lucille Chekhov Project since 2010 (Ivanov, Seagull). 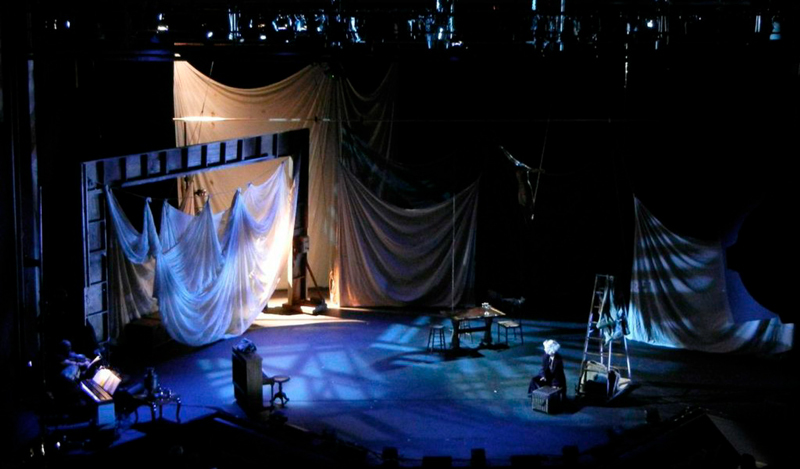 The rights to the works of Tennessee Williams included in this production were granted by the University of the South, Sewanee, TN. “Glass Guignol” was developed at Duke University, Provincetown Tennessee Williams Theater Festival, Sundance Institute Theatre Lab at Mass MoCA, Wesleyan University, St. Ann’s Warehouse, La MaMa Umbria, and Yaddo. Following its performances of “Glass Guignol,” Mabou Mines will introduce its newly created program, SUITE/Space, providing artistic mentorship, development/rehearsal space, and opportunities for public performances in its new 99-seat theater to geographically and ethnically diverse artists from historically underrepresented communities, who share Mabou Mines’ commitment to breaking new ground in form and content. For the inaugural year 2017-18, SUITE/Space artists were nominated by experts in the field and chosen by the SUITE/Space curators Mabou Mines Co-Artistic Director Karen Kandel, Mabou Mines Associate Artist David Neumann, and playwright and former Mabou Mines’ Resident Artist Carl Hancock Rux. SUITE/Space artists, Tariq Al-Sabir, Tamar-kali Brown, Davalois Fearon, and Sanaz Ghajarrahimi will show their work for three performances each from March 26 to April 8, 2018 in the Mabou Mines Theater (exact performance times to be announced). Mabou Mines’ Theater will also be the scene of a series of development workshops for Lee Breuer’s upcoming production of “Medea,” with showings March 23-25. In June 2018, Mallory Cattlett will return as part of the “Resident Return Series” with her Obie award winning production “This was the End,” developed as part of the Mabou Mines Resident Artist Program, featuring part of the original architecture of the former Mabou Mines studio. In fall 2018, the company will premiere Faust 2.0,” a multi-media reimagining of Goethe’s “Faust, Part 2,” directed by Mabou Mines co-Artistic Director Sharon Fogarty, adapted by Matthew Maguire, designed by Jim Clayburgh (set/lights), and Marsha Ginsberg (costumes). “Glass Guignol, The Brother/Sister Play” was made possible in part, by public funds from the New York City Department of Cultural Affairs in Partnership with the City Council, The New York State Council on the Arts, and the National Endowment for the Arts, the Axe-Houghton Foundation, and the W Trust. Support for Mabou Mines is provided by The New York State Council on the Arts, the New York City Department of Cultural Affairs and Materials for the Arts, the National Endowment for the Arts, the City Council and the Manhattan Borough President, the Axe-Houghton Foundation, the Broadway Green Alliance, The Roy Cockrum Foundation, Dramatists Guild Fund, The Fan Fox and Leslie R. Samuels Foundation, the Lawton W Fitt and James I McLaren Foundation, Howard Gilman Foundation, The Indie Theater Fund, the Jerome Foundation, New Music USA, The New York Community Trust, the New Horizons Foundation, the Harold & Mimi Steinberg Charitable Trust, the Shubert Foundation, Theatre Communications Group, and The W Trust, the Mabou Mines Board and generous Individual Donors. SUITE/Space is supported, in part, by The New York Community Trust and by public funds from the New York City Department of Cultural Affairs in Partnership with the City Council. A ribbon cutting for the full building, Community Center 122 which was renovated with funding from the City, will be scheduled for this winter.